Are you looking for blogging tools that can enhance your blog, help with your marketing and help you focus? We asked top bloggers to share their favorite tools. In this article you’ll find 9 blogging tools to check out. Find 9 tips for blogging from the pros. Use BuzzSumo for content brainstorming or to plan blogger email outreach and social media marketing campaigns. Here’s how you can search it and make the most of those searches! 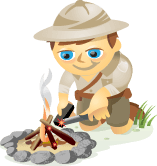 Search for a [domain.com] then sort the results by any of the provided social media network (Facebook, LinkedIn, Twitter, Pinterest, Google Plus or total) to find your most popular blog posts. You can also search for the least-shared page to see which of your blog pages may need additional help! Search [author:Author Name] to see what articles a particular author wrote recently and / or which of them did particularly well on social media. This comes in handy for doing an author audit. Or, if you’re looking to build some influence seeing what other prominent writers do can inspire you. Search BuzzSumo to find articles written by specific authors. Search [shared:@user1,@user2] to see which links any Twitter account is sharing. If you use Twitter as your main trend-monitoring medium, this option allows you to monitor my favorite Twitter account with less clutter. Search BuzzSumo to find articles shared by Twitter users. Create email alerts for any of your searches to help with reputation management and trend tracking. Export results in an Excel file. Limit results by recency. For example, find only recent results containing your brand name. Filter results by type; interviews, articles, infographics, giveaways, videos. BuzzSumo has lots of potential. Check it out. Ann Smarty is Founder of MyBlogU. 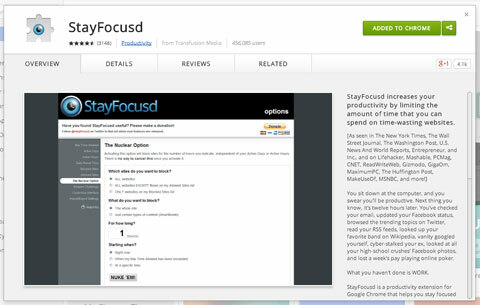 The free StayFocusd app (available on Chrome only) is a must-have for any online blogger or marketer. Stay Focusd lets you block out websites of your choice. You set how long you can spend on your blocked sites, and once you’ve used up that time, they’re inaccessible for the rest of the day. Use Stay Focusd to block out distractions that interfere with your blogging. I personally use the ‘Blocked Sites’ option for Twitter and LinkedIn when I’m crunched for a deadline. You might choose to manage your viewing of Facebook, Pinterest or any other sites that tend to consume your day as a professional blogger. You can also schedule your blocked and allowed sites by day. So, if you tend to blog on Mondays and Wednesdays, for example, you can program the app to block out your email as well as stop you from posting on Facebook, checking Twitter trends, reading Feedly, checking Disqus, even buying that gorgeous pair of shoes you just saw on Pinterest. If you’re really struggling to finish your writing on time, and you’ve done all your online research, the app has a ‘Nuclear Option’ that treats your computer like a typewriter. It blocks out all websites except for those on your ‘allowed’ list; if you’re a blogger who uses Google Docs, this feature is helpful. Krista Bunskoek is a content marketer at Wishpond. Do you often have to upload large audio files and video files via FTP (because they exceed the limit for uploading through the WordPress dashboard)? This doesn’t normally create many headaches, but occasionally, it’s simply not possible to use a file without it being included in the Media Library. For instance, when you add a playlist to a post, there’s no option to insert a URL – only to use files in the Media Library. Creating an audio playlist in WordPress. 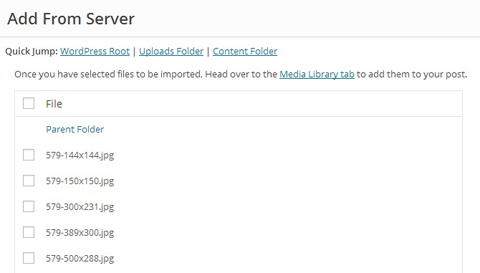 Enter Add From Server, which lets you simply import any files you’ve uploaded into the WordPress media library. It’s simple and intuitive to use, and definitely saved me some time and headaches when adding audio clips to client’s sites. Once installed and activated, the plugin creates a new option under Settings, and one in the media upload window (when you’re adding a post / page) so you can easily get your files into WordPress. Viewing files in Add From Server. The plugin has a 4.8 average star rating, and regularly receives 150 – 200 downloads per day. It solves a very specific problem and does it well. If you do a lot of large file uploading, you’re sure to find it helpful. Ali Luke is Head of Content and the Blogging Trainer for Zen Optimise. Would you like to make it easier for readers to share your posts on Twitter? 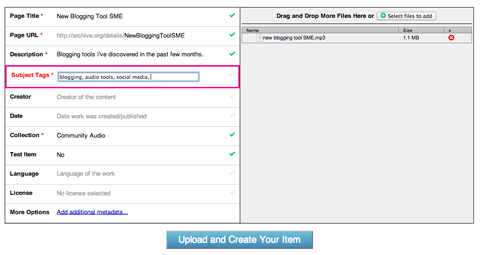 With Easy Tweet Embed, you can easily create multiple pre-populated tweets in your blog post. The pre-populated tweets make it easier for readers to retweet the posts. 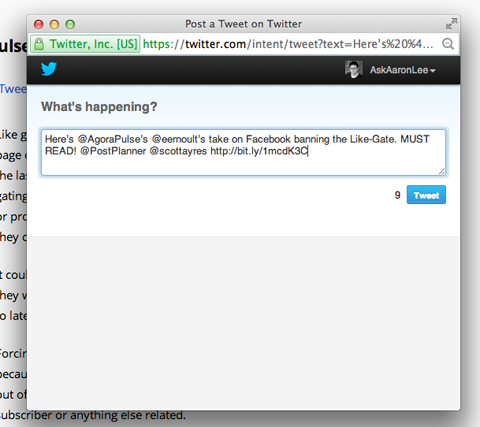 Example of a prepopulated tweet from a Post Planner article. We take it up a notch by adding one point after another in our posts and have noticed readers tweet the same link multiple times using different points. You can also use Easy Tweet Embed to reach and get the attention of influential users. On occasion, tag people and companies in your pre-populated tweets. When a reader tweets a point through Easy Tweet Embed, those people and companies will receive an @ mention. Since installing Easy Tweet Embed on our blog at Post Planner, we’ve seen an increase in traffic, retweets, engagement and followers. Aaron Lee is is GrandMaster of Customer Delight at PostPlanner. 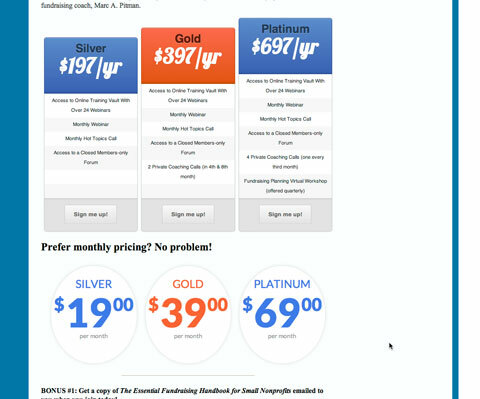 While the free version of Easy Pricing Tables lets you present different pricing options , the premium tables make it amazingly easy to customize column number, color and CSS. The tables move when a user hovers over them and you can choose a “featured” level that will stand out, like Gold level in the image below. Choose different styles of tables, for example columns or circles, to highlight different pricing options. The highlighted level is a different color and when you hover over its circle, a star pops up along with a description of the level’s benefits. You can watch them work here. Apart from their ease of use, these dynamic tables are responsive enough to work on phone or mobile platforms. Give them a try! Marc A. Pitman is author of Ask Without Fear! and an international fundraising trainer. Are you audio blogging or podcasting? If the sizes of your audio files exceed what you can store on Podomatic or Soundcloud without paying an additional monthly fee, I recommend Internet Archive. The site lets you store audio files at no charge. The upload process is easy to learn and navigate. Adding the audio file to Internet Archive. 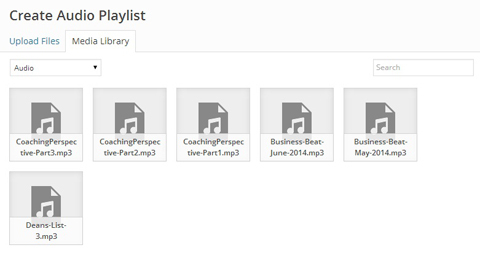 Once the file is uploaded, you can easily embed the MP3 in a player on your blog. The embed code is easy to copy for embedding. If you’re looking for a cost-effective storage solution for your own blog’s audio files, give Internet Archive a try. Debbie Hemley is a freelance writer and social media coach. Whether you (or your clients) opt to start your blog using your name, business name or an off-shoot of it is up to you. Well, to an extent. Before you launch any online presence for your business, make sure all social media accounts related to your name are available. That’s where Namechk.com comes in. 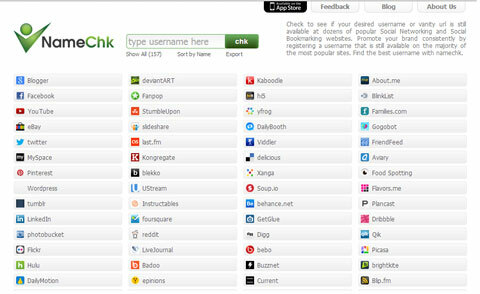 Namechk is the one-stop shop to check the availability of desired url names on all social media platforms at once. The site allows you to search 157 social media platforms, from which you can sort alphabetically or by popularity. Namechk even lets you know if the domain name is available. If not, it’ll give you some similar domain options. Check for any name quickly with Namechk. Type your website name in the search bar and Namechk will mark which social platforms have your name available and which are unavailable. It’s also a nice way to explore and discover some new platforms while you’re at it. This tool is a major time-saver. If your blog name isn’t available, test out similar options related to the business, until you find one that suits your blog and your brand. There’s also an iPad and iPhone app that’s easy to use. Namechk is an easy search to help you come up with a name for your blog and social sites that will complement the existing brand. Debra Eckerling is creator of Write On Online. One of the new tools I use to make visual content for my blog is easel.ly. Easel.ly has a lot of templates you can start with and each one is simple to modify. Just drag and drop the elements, add your text, and change the colors. In today’s visual-focused world, the easier graphics are to make, the better and Easelly makes it easy! Andrea Vahl is co-author of Facebook Marketing All-in-One for Dummies. Do you write blog posts outside of WordPress? Maybe you compose your posts in Word, Pages or software such as Scrivener. 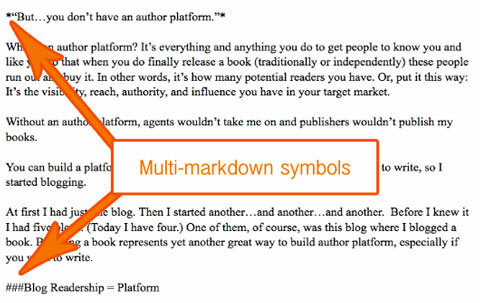 To move your posts into WordPress with automatic formatting, learn how to write posts using multi-markdown symbols and install the Markdown Quicktags plugin. My text in Scrivener with mulit-markdown symbols. Just copy your text from your draft document, paste it into the ‘Text’ view of WordPress then click ‘Render’. The plugin adds 4 options to the bottom of the ‘Text’ view of WordPress articles. 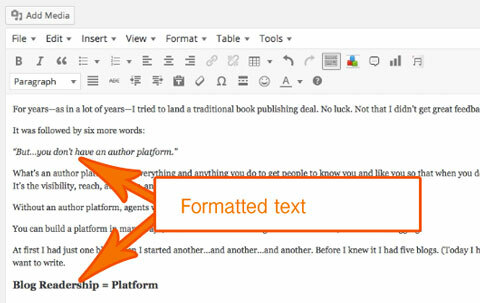 The plugin converts your content to beautifully formatted copy in seconds. My text is automatically formatted. Writing posts in this way takes very little extra time and will saves your a ton of time when it comes to formatting posts in WordPress. Nina Amir is the bestselling author of How to Blog a Book and The Author Training Manual. What do you think? 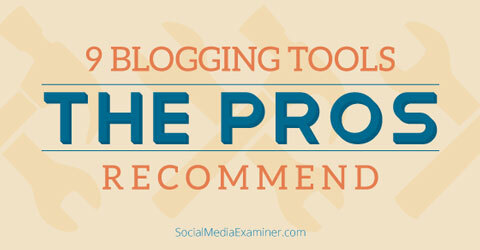 Will any of these tools help make your blogging more effective? What tools can you recommend? Share your thoughts and suggestions in the comments below.